Desperate times call for desperate measures, yes, and times don't get much more desperate than they are in the newspaper industry right about now. But are they really so desperate that they require a wholesale rewriting of copyright law -- one that could utterly stifle the dissemination of news and information? That's exactly what some legal minds are proposing, seeing it as the only solution to the problem of "free riding" by aggregation sites, blogs, and other online entities that summarize and comment on the stories generated by newspapers. 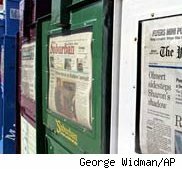 "Expanding copyright law to bar online access to copyrighted materials without the copyright holder's consent, or to bar linking to or paraphrasing copyrighted materials without the copyright holder's consent, might be necessary to keep free riding on content financed by online newspapers from so impairing the incentive to create costly news-gathering operations that news services like Reuters and the Associated Press would become the only professional, nongovernmental sources of news and opinion," wrote legal scholar Richard Posner a few days ago. Columnist Connie Schultz took up the standard this week, championing the arguments of David and Daniel Marburger, a First Amendment lawyer and an economics professor. They also think copyright law needs to be revised to prevent the "unjust enrichment" of "parasitic" web operators and the bleeding to death of newspapers. Their solution: a 24-hour window in which a given piece of news would be exclusive to the outlet that broke it. This idea is not totally without precedent: The so-called "hot news doctrine" bars wholesale re-reporting of a news outlet's stories in cases where such re-reporting inhibits the original outlet's ability to survive. But the hot news doctrine has been interpreted pretty narrowly in recent years, and rightfully so. A copyright regime like the one Posner and the Marburgers are calling for would be an incoherent mess, totally out of step with the pace of the Information Age and utterly inimical to the principles of free speech and debate. Is it really reasonable to expect a blogger who reads a story in The New York Times to wait 24 hours before commenting on it, or pointing out an error it contains? Do we really want a news culture where people are sitting on their hands, pretending not to know what they know? Moreover, it's not as though the flow of information is one way, from newspaper to blog/aggregator. Newspapers are constantly scrambling to "match" each others' reporting, or at least to acknowledge each others' scoops so as not to appear clueless. Does this make them "free riders"? And what happens when the news breaks first on a blog, as it does plenty often these days? As Jeff Jarvis points out, TMZ would have had a 24-hour exclusive on the news of Michael Jackson's death. That's just unimaginable. There are plenty of good ideas floating around about how to save newspapers, or at least cushion their fall enough to ease the transition into whatever comes next. This is not one of them.